Thank you for choosing Gulf States Glass. We look forward to working with you soon. Our staff is on call to address any questions or concerns you may have. Contact us at the numbers listed at the right to schedule a service. We are primarily a mobile service but if you would like to come to us, we now have a shop which is located at 13405 Unit 15 Seymour Meyers Boulevard, Covington, LA 70433 Click here for a detailed map. 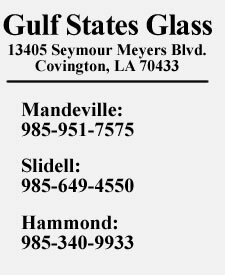 We are locally owned and operated and we thank you for doing business with Gulf States Glass! Hours of Operation Mon.- Fri. 8a.m.- 5p.m.